Hi, my name is Shauna and I'm a wannabe MUA. So I don't exactly know when I first got addicted to make up or how it all started but I'm obsessed. I would spend hours on end messing around with new eyeshadows and combining lip shades to make new colours, and I'm so excited to be starting a make up course part time now in a few weeks. I find that browns, oranges and warmer tones suit my eyes really well and make the blue pop so to say I've hit pan on these colours is an understatement! I'm working on a blog post where I do eye looks to suit each eye colour but it'll probably take some time as I'm yet to find someone with green eyes haha! 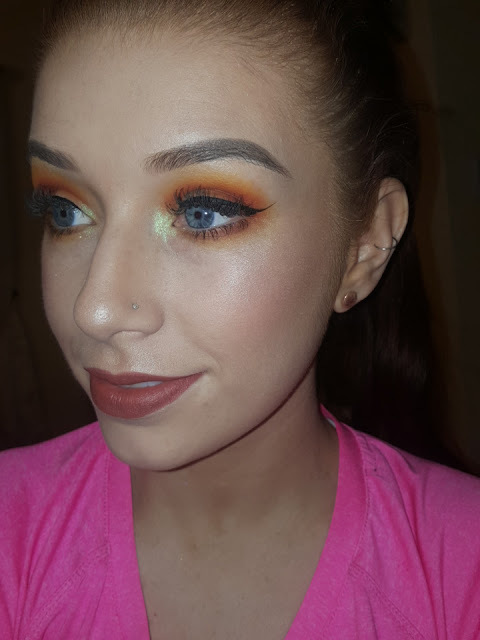 So this burnt orange look is definitely a go to for me and it's all Inglot products (Inglot is like my Penneys for make up) and its subtle sunset eye with a pop of pigment on the inner corner. Firstly I start with a yellow shade, number 60 from Inglot, and blend over most of my lid and in thecrease and I would also bring each colour under my eye too, the darker the colour the less product I apply under my eyes. I then blend an orange tone into the yellow, number 335, using the same blending brush. Then to add depth I used shade 300 which is from the What a Spice collection and its a soft brown shade and it goes really well with 335. Then lastly I added a pink/red shade, number 50, which has a shimmer to it, This gives the 'sunset' look to the eye make up, but you could also use shade 304 from the What a Spice collection instead and that would create a more smokey eye. The final touches would be your winged liner (optional), mascara and I also like to add pigment number 45 to my inner corner, I love this pigment and find it goes with any make up look especially warmer tones. I'm wearing Inglots HD foundation in the shade 73 with Penneys pressed powder in medium over it, Anastasia pomade in the shade soft brows on my brows and my lipstick is of course the €2 one from Penneys, best lipstick ever! I'm the furthest thing you'll get from a make up artist but I just love playing around with all the colours and I hope this was useful to at least one person!